Dave & Ann-Marie's life aboard NB Legend. Last August, me and the bunch of blokes I worked with all got made redundant. Some of them had been with the firm for 20 odd years so they got a decent lump. Enough to make a diference. There was lots of speculation about what we'd do with it. I paid a large chunk of the mortgage off with mine, a couple of guys took early retirement. One chap - two or three years older than me - booked a cruise, some bike lessons, went shopping for a Harley and had six months off. I went to his funeral yesterday. He had a heart attack shortly after starting a new job. It hits you like a train when one of your peer group cops it. I've worn a suit twice this year - twice too often. It has made me even more sure that we're doing the right thing. Sorry for the delay in posting this week, all this lovely weather and a full calendar spirited the days away while we weren’t looking. We’ve just had a fabulous weekend! On Saturday Bourne Borderers were invited to dance at the Long Sutton flower festival which is just down the road from us. If you’ve ever been to South Holland at this time of year you will know that flower festivals, centred around local churches, are a very big part of the social calendar. The displays are always stunning and very well attended with visitors coming from all over the country. It goes on for about a month, culminating in the Spalding Flower Parade. Ann-Marie and the rest of the side did two sets with a St George and the Dragon mummers play in-between. Dave was in the perfect position to take pictures, but was overcome by muppetry and failed to take any. Sorry. We’ll pinch some off someone and put them up soon. 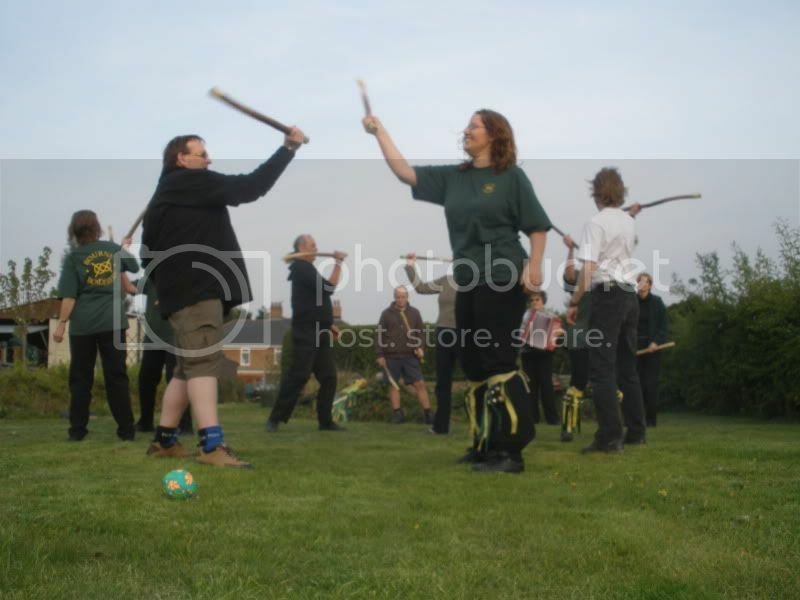 After it was all over we invited everyone back to our house for a BBQ and an evening round the bonfire, which is how we got to have Morris Dancing in our garden. The weather could not have been better and everyone had a good time. We promised them we’ll do it again later in the year if we haven’t sold the house. On that note, we had another viewing last week, which meant Ann-Marie rushing home and flying round the house for an hour before they arrived, all to no avail. Those who know these things reckon that house buyers make a decision within eighteen minutes of arriving. We think these two were well below that! Sunday was a bit dull to start with, so we had an unusually lazy morning. It brightened up in the afternoon though, so we made a start on the fence line behind next door’s garage. This turned into a major project with fence posts coming out and new flower-bed borders going in. The result was worth all the hard work; The pathway up between the sheds and past the deck looks wider and so much neater now. On the workshop side of things, Dave went to the scrap yard this week with a trailer full and came home with £55. Result! The lino is down in the Kon-Tiki and the roof box is mended and back on top. (We think someone at sometime went under a low branch!) It’s now having its wheels painted so we can get shot of the hideous blingy wheel trims that it came with. There are a few other little jobs that need doing in the van but none of them need workshop facilities so we can do them on our travels. 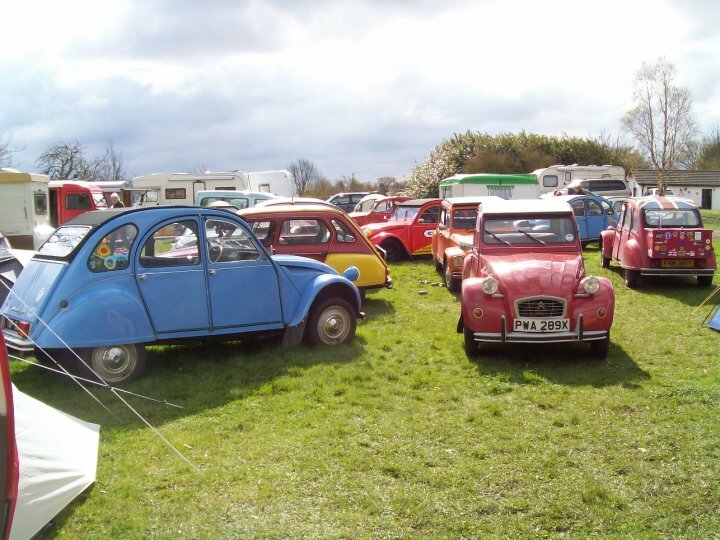 Dave is now going to get on with the last car on his list; the Plums & Custard 2CV Dolly. This week’s scores - ticked off lists; 5, added; 1. That's more like it!. So here we are back at square one, the house is back on the market and we’re waiting for the phone to ring. We asked you to come with us on our travels and feel like we’ve let you down somewhat by not actually travelling yet but after a week of doom and gloom we’re back to being positive, it only takes one person! We love our house, our garden and the community that we are a part of and know there must be someone else out there who thinks the same as we do. Dave has spent most of the week in the garage again, this time with the Berlingo. He fitted a new front suspension spring, timing belt and clutch. It now feels like a brand new car and has a shiny MOT to go with it. He has now turned his attention back to the Kon-tiki and prepared the floor for the new lino. Ann-Marie has had a busy week dancing, 3 practice nights and 2 bookings, one with Slapdash at Moulton Mill for a St Georges celebration and one with Pig Dyke Molly at the Joint Morris Organisation Day of Dance in Bury St Edmunds. We took advantage of the fantastic weather on Sunday and spent the day tidying up the garden, pulling out bindweed and dandylions, emptying the duck pond, cleaning out and topping up the fish pond and mowing the little lawns. A very productive day that left the garden looking spick and span. We finished the week on a high. For the first time in a long time we had a 2CV on the road for the monthly Middle East Nomads 2CV club meeting at the local pub. Good beer, an excellent carvery and great company, maybe staying put for a while longer isn't so bad after all. Things that seem too good to be true ususally are. For one reason or another our buyers have pulled out. Even though we're only back to where we were two weeks ago we feel totally gutted. In those two weeks we'd got ourselves geared up to move into the van in five to eight weeks. We sold most of our furniture and planned our summer. That'll serve us right for getting cocky. Since it all fell apart yesterday we've both heard of other peoples' experiences of failed sales. At least we've only lost some time and not the house of our dreams. This week Ann-Marie is driving round with a big grin ‘cos she’s back in a 2CV. Yes, the blue one – “Blue” - passed his MOT like a good little soldier, now she’s just got to get used to not having power steering or servo brakes again! Dave’s attention has been transfered to the Kon-tiki; the horrible old brown shag-pile has bitten the dust (lots of dust!) and we’ve got some lovely new lino to fit instead. There’s a new awning on the side, and the bed over the cab now lifts up and stows for travelling, which means we can leave it made up and it gives us a lot more headroom. The postie lady brought a wad of forms from our solicitors for us (ie. Ann-Marie) to fill in. There is an endless string of questions about what we are leaving in the house. Who the heck takes window handles with them? At the weekend we went to Dave’s cousin’s 50th birthday party. It was in Exeter and due to us chatting and not paying proper attention we went the pretty way, the very pretty way! We got back this afternoon in record time after a four and a half blast up the motorway. We’re looking forward to a time when we can take a week to get from one part of the country to the other without touching a motorway. It was a fantasic party, and despite us thinning out early we had a great night. We love being part of such a brilliant family. Of course being lightweights meant that this moning we were up and wide awake long before the people who went to bed at six, so we went for a walk around the Canal Baisin at the end of the Exeter Ship Canal. Exeter flourished through the woollen trade and the wharfs and warehouses round the baisin were the centre of commerce at one time. There was a lot of activity there this morning too, It was a beautiful sunny morning wtith spring flowers out all over the place. People were rowing, running, cycling and walking dogs every where we looked. Roll on Summer! It's cheaper by the yard. As you can imagine life has got a trifle hectic since Wednesday, the couple that our buying our house are cash buyers and want to move in under 8 weeks so the pressure is on. We’d planned a yard sale for Easter Sunday so it was handy that there was a 2CV Easter rally at a pub just a few miles away, not only could we have a great weekend camping with friends but they also came along and rummaged through the garage thinning it out considerably. On Saturday we popped home from the camp, Dave and a couple of mates spent the day clearing the garage and spreading stuff out on tables while Ann-Marie went dancing in Downham Market with Pig Dyke Molly. Home again on Sunday, feeling like yo-yo’s, we laid out all the household stuff that won’t fit on the boat. Our neighbours joined in too so it was like a mini car boot sale with a steady trickle of punters from 9 till 4. We were really pleased with the amount we sold, including most of the furniture in the house (looks like we’ll be sleeping on airbeds in a couple of weeks then!). Thank you to everyone who helped, we could never have done it without you, and thank you to everyone who came along and bought all our stuff, we had a great day and we hope you did too. If anyone has any photos could you please let us know, we were a bit busy! There are still enough tools and household items to do a car boot or two, anything left over will go to charity shops or jumble sales. The people that are buying our house are just the sort of people we want to sell it to. We’ve loved our time here, building our world within this little community, and we get the feeling that they’ll fit in and be happy here too. They get it. They can see the effort that has gone into creating what we have here; the workshop, veg beds, fruit beds, ponds and gardens, and we know that they’ll carry on using it as we intended it to be used. Would we have sold it to people we didn’t like? We’d like to think not, but there is a clause in every estate agent contract that says the seller can’t refuse a reasonable offer. Thankfully they’re lovely and we don’t have to answer the question. A lot of things got added to our lists this week, and only a few got ticked off. To be honest we have no idea where we are and we really need to start a new list. Our heads are spinning. Everything from mail redirection to the logistics of getting the stuff that we’re keeping to the people that are keeping it for us, to deciding which way we’re going to stay connected. It’s a bit like juggling custard. Right, we must get on. April the first - I kid you not. This is all getting rather spooky. We said we'd probably put the house on the market some time around Valentine's Day 2010, and like clockwork, that's what happened. Since then, despite really trying not to have a plan, we've often found ourselves musing about possible scenarios. The most hopeful ones begin with "If we sell by the end of March....", and end "...but of course that's never going to happen." You guessed it. Yesterday we accepted an offer. What was that whooshing noise? That, Dear Reader, was the point of no return. Dave and Ann-Marie are now desperately trying to avoid eye contact in an effort to cut down on all the inane giggling. River Thames. Dukes cut to Oxford Via Lechlade. Gloucester and Sharpness Canal. Splatt Bridge to Rea Bridge. When we met we had dreams of a narrowboat but life took over and our boating plans got put on hold. We never forgot our dream though; we borrowed a boat for a couple of trips, had a hire boat holiday and promised that ‘One day we’ll do it’. The kids moved on and moved out and it was just the pension left to tie us. Then Dave got made redundant and the final tie was cut. We needed the money from the house to buy a boat and didn’t want to buy the first one we saw just for somewhere to live, so we bought a campervan. We sold the house and, in a state of freedom between mortgage and mooring fees, went on an eight month friends and relations tour of Europe, New Zealand and Australia. When we got back we went boat hunting. We found one called Legend that ticked all our boxes and we moved aboard in April 2011. We’re Continuous Cruisers which means we don’t have a permanent mooring and can stay up to 14 days before moving on, so we’re slowly exploring the 2,000 miles of England’s waterways. This is a log of our journey; selling a house and its contents, going around the world and then learning how to live in a tin can. It’s been emotional. It’s been an adventure. It’s still going.